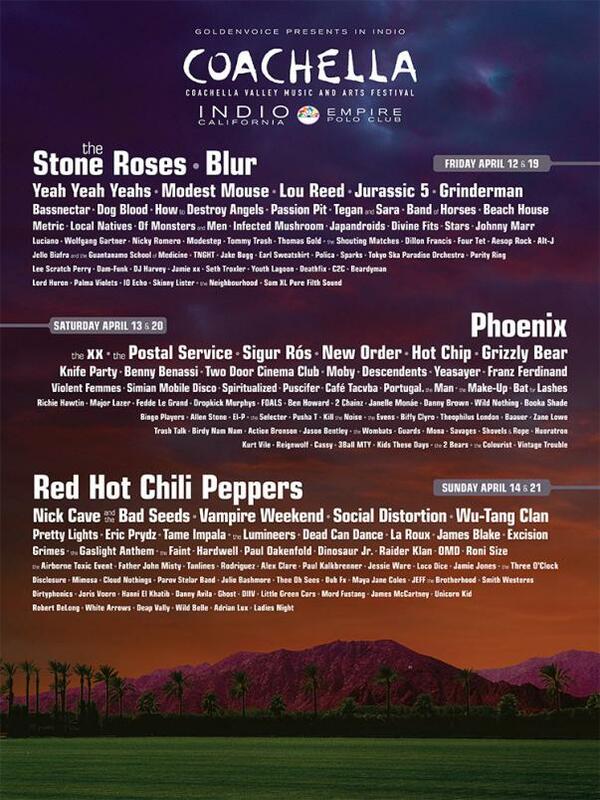 The lineup for this year's Coachella Music and Arts Festival has been announced, some of the bands playing over the two weekends are: The Stone Roses, Blur, Red Hot Chili Peppers, Wu-Tang Clan, New Order, Japandroids, Spiritualized, Dinosaur Jr, Grimes plus many many more. I'm afraid that the rumors about offers from the organizers to make the festival all-vegetarian to entice the Smiths to reunite was just a rumor, the closet you will get is seeing Johnny Marr live. The festival takes place over two weekends, April 12th-14th and 19th-21st, at Empire Polo Grounds in Indio, California. You can purchase your passes here.